Vietnam will become the 150th member of the World Trade Organization on 11 January, the global body has said. The move will give the country more access to overseas markets but will force it to cut high import tariffs. Vietnam is Asia's strongest performing economy after China. Its economy is expected to grow by 7.8% in 2006. The country has informed the WTO it has ratified its membership agreement. The move comes after approval by Vietnam's Communist-dominated national assembly. 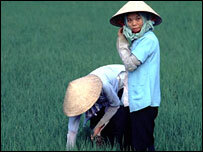 The move finalises Hanoi's near-12-year wait to join the WTO. President Nguyen Minh Triet had said membership "will directly impact Vietnam's economic relations with other WTO members and the global economy". "It will offer us big opportunities in domestic and foreign investment and help elevate the position of Vietnam in the world."